​Artists Brogan Bunt, Lucas Ihlein and Kim Williams invite you to join them as they walk upstream, exploring the social, environmental and suburban fabric of our local creeks. This exhibition presents video, photography, works on paper and an array of playful objects as evidence of the important role played by water in the Illawarra region. The exhibition will be launched by Dr Joshua Lobb, Senior Lecturer Creative Writing, University of Wollongong. The Walking Upstream team invite you to join them on a series of local creek walks as an integral part of the exhibition. Return to Wollongong Art Gallery in the afternoon to view the exhibition. Sunday October 29: Join botanist Charles Huxtable on a walk up American Creek with a focus on the myriad plant species that inhabit the riparian zones of the Illawarra. Sunday December 10: Join Dr Cath McKinnon, author of Storyland , on a walk up Mullet Creek discussing the complex histories surrounding the waterways of the Illawarra. Sunday 28 January: Join Les Bursill, a Dharawal historian, archaeologist, anthropologist, and publisher, as we walk up Ooaree Creek (near Gerringong). 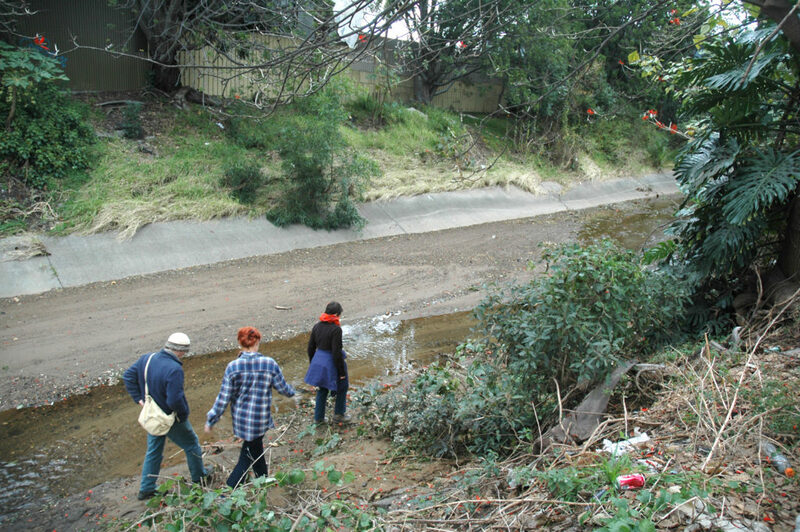 Sunday February 11: Join the Walking Upstream team on a mystery creek walk! Details to be announced closer to the date. Click here to download or view the exhibition catalogue, with essay by Vincent Bicego.